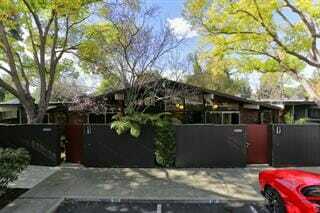 Stunning and rarely available Mid-Century Modern Eichler. Vaulted open beam ceiling and wall to wall windows let in abundant natural light. Cozy wood burning fireplace and radiant heat floors will keep you warm all winter long. Two ground floor master bedrooms with spacious courtyard and garden patio with easy access to the sparkling community pool from the backyard. Located in the coveted Greenmeadow neighborhood of Palo Alto. Close to major employers, shopping, dining, excellent schools (buyer to verify schools) and freeways. Assigned parking (2 SPACES) and covered parking with extra storage at parking area and in backyard. HOA dues cover most utilities, just pay for electricity.